Protect bulky gear and extend their performance lifetime with the GI Spec 3-Fold Shovel Cover from 5ive Star Gear. The cover is modeled after the original government issued 3-Fold E-Tool Cover, matching military-grade specifications and departmental guidelines for personnel. 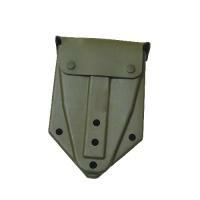 5ive Star Gear's cover is crafted from strong plastic, made to withstand the wear and tear of daily use in the field. The casing features a metal snap closure to keep shovels and other equipment secure. It includes two keepers at the rear, allowing for secure attachment to belts or packs and versatile carry options suited to user preference.